The Great Debate – Has library 2.0 fulfilled its promise? This is the last session from ALA I took notes on. It went by fast and I tried to be as accurate as possible. David – that at the reference desk if someone says the library is awesome you have to remember write it down and remember it, but with web2.0 tools you have that information saved for you. David – admins and managers let your staff go, the worse that could happen is that you have a failed project you learn something from. 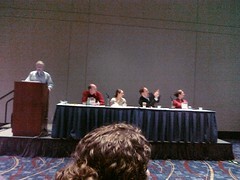 Question from audience – TaraLSF: #ala2009 #lib2.0 how can library 2.0 technologies be supported in actual libraries & brick & mortar buildings with F2F services? Roy – technology petting zoo, which tools or hardware would you show them? Thanks for taking these thorough notes. I’m grateful for people like you who share their ala experience and notes. Not sure what I think of the discussion though. Whenever the Library 2.0 topic comes up, it goes in many different directions and it feels like blind men describing an elephant.